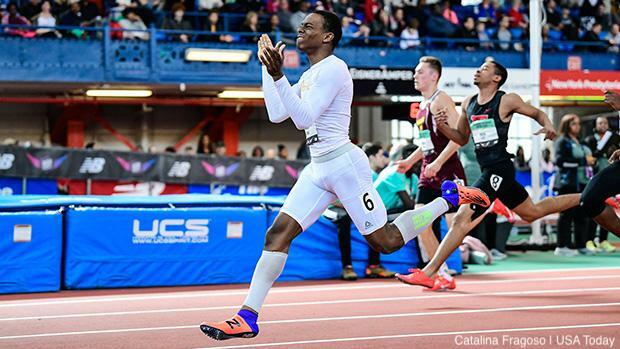 If the early sprint performances at New Balance Nationals are any indication of what's to come, then we are in for quite a treat. Not to be outdone by Kimberly Harris' Emerging Elite 60m dash record, Prince George (VA)'s Javonte' Harding threw down an incredible US No. 5 time of 6.77 seconds to bring home the win on the boys side. Harding is coming off a Virginia Class 5A state title in the 55 meter dash (6.38). And he shattered the record, too, running a tenth of a second better than the three who were tied for the record at 6.87. He is also entered in the Championship 200 with a seed time of 22.29 and is entered as a leg on the Royal Nation Emerging Elite 4x200 relay squad. Fellow statesman Tyler Thompson (Woodside, VA) also ran under the record, hitting a US No. 20 6.85 for second.